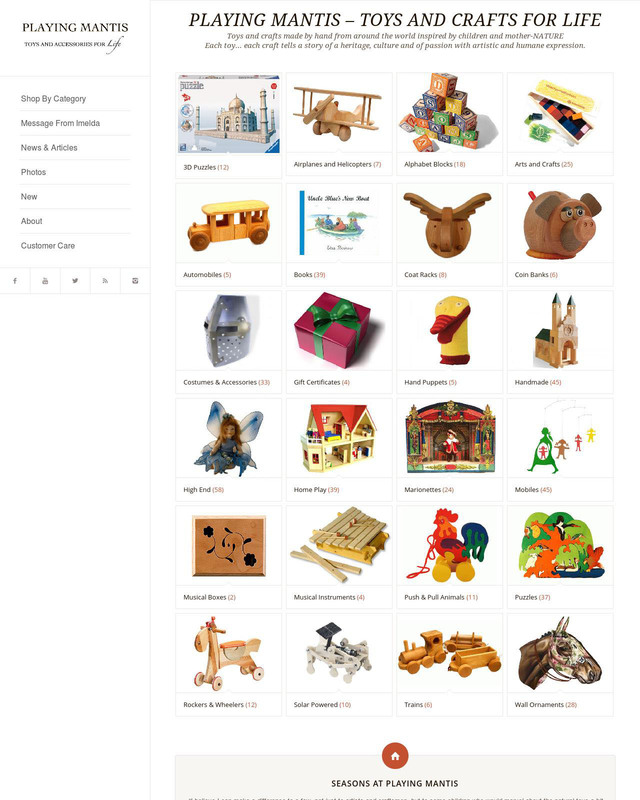 Toys and crafts made by hand from around the world inspired by children and mother-NATURE Each toy…each craft tells a story of a heritage, culture and of passion with artistic and humane expression. Dolls made by women from Argentina supporting and recognizing their work. Promoting their life with dignity and helping in the construction and growth of Periito Moreno school. Dolls and Crafts from Community Creations in Africa. Helping the community through training skilled, unskilled, able and disabled to create wonderful products that support and promote better human conditions. Wooden toys and woven crafts from Tahanang Walang Hagdan (House with no Stairs) that provides employment and opportunities for persons with disabilities . Wooden toys from Camphill Village in New York. A residential community including adults with developmental disabilities working for the renewal of socio-economic , cultural and spiritual life. Tree Blocks: toys that uses discards of managed paper forest in bringing children closer to nature with their imagination and creativity. Wall sculptures made entirely from very old found weathered boards from barns. Expressing the shadows of time and textures of nature. Building wooden Blocks from a Math teacher’s creative mind. Wooden Puppet sets from a Music teacher in Hungary. Felted Pictures from a mother and handcraft teacher using plant dyed wool. Birdhouses from a family business nestled in the foothills of Catskill Mountains that handcrafts items from a salvaged barnwood from the scenic Hudson Valley in New York utilizing no glue or stains to preserve the natural integrity of the wood. Colonial Funnel puppets made with kitchen funnel for the base and a dried apple for head. Scraps from cloth from making of children’s clothing were used to dress the puppets. Sunbridge College Studio . Work and teaching that seek to transform natural fibers in creating beautiful articles for daily use. Wooden toys and crafts from The Fellowship Community. an inter-generational work base long term care community founded in 1966. All ages live and work together with the focus of care on the elderly , the care of lands, gardens, animals and the environment. And some popular toys and crafts with gentle regard to nature and children.